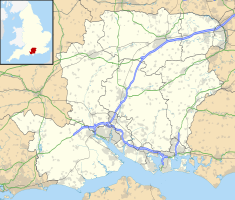 Domus Dei (Hospital of Saint Nicholas and Saint John the Baptist) was an almshouse and hospice at Old Portsmouth, Hampshire, United Kingdom. It is now also known as the Royal Garrison Church and is an English Heritage property and a Grade II listed building. The hospice was established by Peter des Roches (sometimes wrongly named as de Rupibus), Bishop of Winchester in around 1212 A.D. In 1450 an unpopular advisor to the king, Bishop Adam Moleyns of Chichester was conducting a service at the chapel of Domus Dei when a number of naval seamen (resentful of being only partially paid and only provided with limited provisions) burst into the church, dragged out the bishop and murdered him. As a result of this the entire town of Portsmouth was placed under the Greater Excommunication, an interdict which lasted until 1508, removed at the request of Bishop Foxe of Winchester. In 1540, like many other chantry buildings, it was seized by King Henry VIII and until 1560 was used as an armoury. After 1560, a mansion built close by the south-side became the home of the local military governor. Throughout this time the chapel attached to the hospital remained in use. In 1662 the mansion hosted the wedding of King Charles II and Princess Catherine of Braganza. Towards the end of the seventeenth century it fell into disrepair until it was restored in 1767 to become the Garrison church. Once again, the Church fell into disrepair and in 1865 a new restoration project began under the direction of G. E. Street which lasted ten years. On 10 January 1941 the buildings of Domus Dei were partially destroyed in an attack by German bombers, when all the stained-glass windows were blown out and the nave was rendered roofless by incendiary bombs and a single high explosive bomb. New glazing was subsequently fitted. Apart from the East window with its traditional design, all the other windows show much of the British Army's relationship to the Church and the City of Portsmouth. The chancel is intact, but the nave remains roofless. Henry Press Wright (1873). The Story of the 'Domus Dei' of Portsmouth: Commonly Called the Royal Garrison Church. James Parker and Co.
^ a b c Historic England. "Royal Garrison Church (1245790)". National Heritage List for England. Retrieved 28 November 2018. ^ "Beginning of the Wars of the Roses". The Orb. Retrieved 28 November 2018. ^ Wright, H.P. (1873). "The story of the 'Domus Dei' of Portsmouth, commonly called The Royal Garrison church". James Parker & Co. p. 148. ^ a b Elliott, Julia (2005). Heritage Unlocked - Guide to free sites in London and the South East. London: English Heritage. pp. 72–73. ISBN 1 85074 881 0. Wikimedia Commons has media related to Royal Garrison Church, Portsmouth. This page was last edited on 27 January 2019, at 21:14 (UTC).